Today we spotted Microsoft Live Mesh product promotion link in Google Search Sponsored Links section. Google shows few top most links of products in search results as Sponsored Links when the product vendor use Google Adwords for advertising. 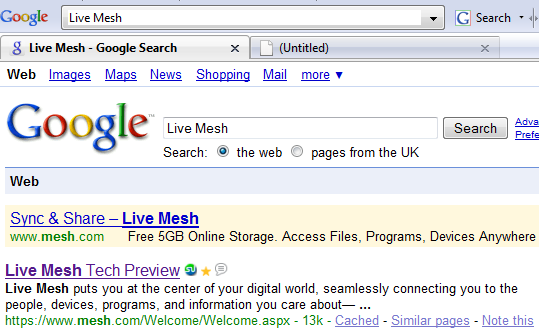 Here is the screen capture of Google Search results when searched for Live Mesh. Clicking on the sponsored link leads to Microsoft Mesh Website. This shows that Microsoft is using its rival advertising platform for promoting it products. This is not the first rival product Microsoft uses for running its business. Instead of using SilverLight, Microsoft uses rival Adobe Flash for presenting multimedia content on it websites.